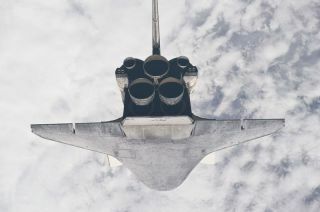 Backdropped by a blanket of clouds, the space shuttle Atlantis is featured in this image photographed by an Expedition 23 crew member as the shuttle approaches the International Space Station during STS-132 rendezvous and docking operations on May 16, 2010. HOUSTON- Astronauts on space shuttle Atlantis conducted a final inspection of theirspacecraft?s heat shield Monday in preparation for their return to Earth. Ascurrently planned by NASA, Atlantis will be landing for the final time thisweek after flying 32 missions since 1985. Theinspection is part of work to ready Atlantis for itssafe re-entry into the atmosphere and landing at the Kennedy Space Center inFlorida after a week-long visit to the InternationalSpace Station. The first landing opportunity is targeted for 8:48 a.m. EDT(1248 GMT) on Wednesday, weather permitting. ?Ifully expect things will look good and we?ll be ready for landing onWednesday,? said NASA mission operations representative Brian Lunney on Sunday. Atlantisand its crew are returning home from the International Space Station (ISS) afterseven days docked to the orbiting laboratory, where they installed a new Russian researchmodule and changed out six solar array batteries over the course of three spacewalks.The shuttlelaunched on May 14 and undocked from the orbiting lab on Sunday. Toprepare for their return, Atlantis? commander Ken Ham, pilot Dominic ?Tony?Antonelli and mission specialists Piers Sellers, Garrett Reisman, Stephen Bowenand Michael Good spent Monday morning using the shuttle?s robotic arm and its50-foot extension boom to conduct a routine ?late inspection? of the orbiter?sthermal protection system tiles and reinforced carbon-carbon surfaces,including the wing leading edges and nose cap. Theinspection is to ensure Atlantis was not damaged by micrometeroids while dockedto the station, but it will also provide analysts on the ground with the chanceto add to the abbreviated survey data that was collected earlier in the missionafter a cable snag prevented the use of the extension?s primary camera system. Reismanand Bowen clearedthe snag during the mission?s second spacewalk, so the boom and itsassociated sensor package was fully operational for today?s survey. Otherimagery and engineering data was used to fill in gaps in the post-launchinspection. ?We?veconvinced ourselves, as a team, through all of the launch imagery that we?verecovered via the solid rocket boosters recently, as well as the standard launchimagery, the wing leading-edge sensors, the [modified] flight day twoinspection that we got via the digital camera on the orbiter boom sensorsystem, the rendezvous pitch maneuver images and then images obtained duringthe first spacewalk that Atlantis and its tile are ready to go and we just needto do the standard orbitaldebris inspection,? explained lead shuttle flight director Mike Sarafin. Space shuttle inspections have been standard parts of every mission since heat shielddamage led to the tragic loss of shuttle Columbia and its crew in 2003. Atlantis'heat shield has already received a clean bill of health after two earliersurveys during this mission. Today's inspection is the final look at the heatshield to make sure nothing has changed while Atlantis has been in space. Whilethe inspections are going on, Good and Bowen were also scheduled to stow thespacesuits using during the mission?s spacewalks for landing. All theastronauts will also take part in exercise sessions to help prepare theirbodies for the return to gravity. OnTuesday, Ham and Antonelli are scheduled to test the wing control surfaces andthrusters that will enable Atlantis? entry glide through the atmosphere whiletheir crewmates will begin packing the cabin for landing and stow the highbandwidth communications antenna that enables video to be sent to the ground. Theastronauts will also take part in one last set of media interviews includingone for Comedy Central?s ?The Colbert Report? with comedian Stephen Colbert. NASA currentlyplans to retireAtlantis after this flight, but will ready the spacecraft to serve as arescue ship as a safety precaution for the agency's final space shuttle missionslated to fly in late November. NASA and some lawmakers have been lobbying totake that rescue mission and turn it into a full-fledged extra shuttle flightfor Atlantis, but the space agency has not yet received approval to add theflight. Afterthis mission, only two more shuttle flights remain, on shuttles Discovery andEndeavour, before the orbiter fleet is retired to make room for new technologydevelopment and vehicles aimed at sending astronauts to an asteroid or Mars. POLL: Should NASA Retire the Space Shuttles? SPACE.com is providing complete coverage ofAtlantis' STS-132 mission to the International Space Station with Senior WriterClara Moskowitz and Managing Editor Tariq Malik based in New York. Click here for shuttlemission updates and a link to NASA TV.